Naim are a venerable high end audio manufacturer, based in the UK. Although the company have been around for over forty years they continue to innovate, and over the past decade have released a sequence of pioneering digital music players and servers. The Naim product line up includes a number of wireless and network digital music players. The most recent devices, Mu-so, also move the design aesthetic for Naim on a generation. In addition to the players and streamers, Naim also make amplifiers, speakers and all manner of accessories. All of the digital music players are controlled by the Naim control app. Using the app you can navigate your music library and the streaming services the Naim device is hooked up to. All this with high resolution album artwork! Assuming the artwork exists, of course. For a self stored music collection, streamed via UPnP, the artwork must already be present in the collection. Wait... UPnP? What's that? UPnP is, amongst other things, a standard for streaming music between your devices. A UPnP server makes your music library available, and your Naim device connects to it, to show the library and play the music. What this means is that the Naim devices are dependent on the UPnP server to send it the artwork. And because UPnP is a standard, not an actual device, your success with Naim album art can depend on the actual UPnP server you use. Other than their own UPnP server integrated into the UnitiServe music server, Naim recommend Asset or EyeConnect. That's not much help though if you don't have a choice; sometimes you have to use the UPnP server that you're given, for example if you are streaming from a NAS device. In such cases, you must use the built-in UPnP server. So, the best way of fixing album artwork for Naim is to follow your UPnP server's advice. Ensure that any options for album artwork in your UPnP server are enabled, and check how the UPnP server requires album artwork to be stored: as separate image files, and/or embedded in the music files. But are there any general guidelines how best to store artwork for Naim? How can we maximise the chances of our UPnP server picking up any artwork we have and sending it to our Naim app? Broadly speaking, I think there are some rules we can follow. The most important consideration is where the artwork is stored, so that a UPnP server can find it. For this, store both an image file and embed the artwork inside the music files. A secondary consideration is image size. Historically, there have been issues with UPnP servers not supporting artwork above certain resolutions. Generally, I believe you should store artwork in as high a resolution as possible, but it's not much use if it's never displayed in your Naim app. So, consider aiming for high resolution art, and only reduce the size if it isn't working (and also consider changing your UPnP server). So how do we use bliss to use those rules? Let's jump to the walkthrough. So let's start by assuming you have already downloaded and installed bliss. 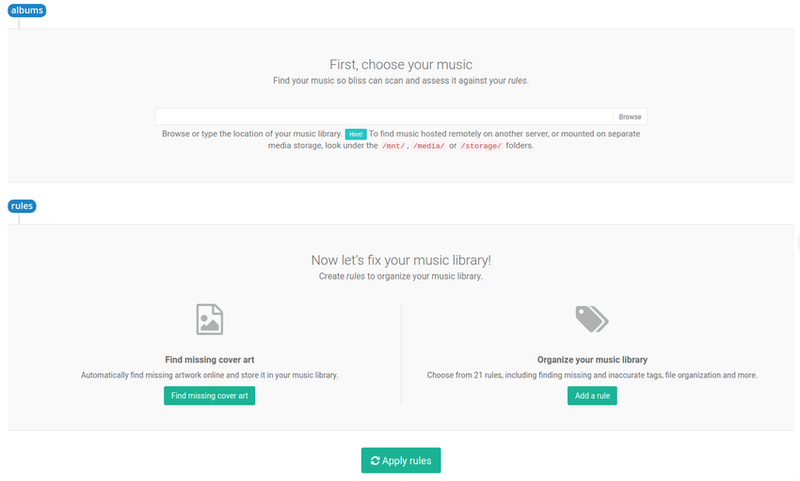 First, you enter the location of your music library. As Naim requires a UPnP server to stream the music to your network player, this will be the location of music from which the UPnP server streams. This may be on the same computer on which you run bliss, if the UPnP server is running on your computer. If your UPnP server is running on a NAS or elsewhere, you will need to mount the network drive. Ensure Embed cover art in music files is set to "Embed art where possible"
The optional limitations on resolution I mooted can be controlled by pressing more. But for now, let's leave that alone. If bliss finds an album with neither embedded artwork nor a folder.jpg, it will find artwork online and install it, embedding and saving to folder.jpg. If bliss finds an album with existing embedded artwork, but without a folder.jpg, it will save the embedded artwork to folder.jpg. It will perform the same activity, vice versa, when the embedded artwork is missing but the file exists. If both items are present, bliss will not perform any work. If you have the resolution limitation enabled, bliss will assess the image size. Once an album has been assessed it will be marked as Compliant or Non-compliant. If it's the latter, bliss will have failed to either save the folder.jpg or embed the artwork. Common causes of this may be write-protected files or the infamous hidden Folder.jpg. I hope this helps complete your Naim album art, and ensures it displays on the devices or in the app! Thanks to for the image above.